The following are the prepared remarks for Iowa Gov. 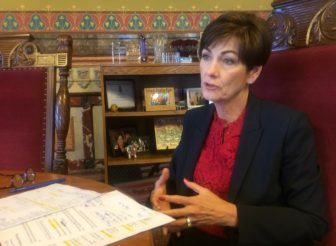 Kim Reynolds’ 2019 Condition of the State address, delivered on Jan. 15, 2019. The job of government, above all else, is to provide for the health and safety of its citizens. So I want to begin this address by thanking the people who are on the front lines of providing that protection: the men and women who serve in military, law enforcement, and as first responders. They risk their lives for us. And some of them give the ultimate sacrifice. It was with great sadness that, last week, we laid to rest Clinton firefighter Lt. Eric Hosette. And it is with prayerful hope that we watch Firefighter Adam Cain recover from the same tragic event. For these men and women, service isn’t just part of their job. It’s who they are—whether the uniform is on or off. Take Billy Fox. After graduating from Central College, he enlisted in the Army and joined the special forces. After almost eight years of active service and tours in the Middle East, Billy returned to civilian life. He began his job search through Home Base Iowa and eventually landed at Vermeer, back home in Pella. He started on the production line and quickly became the head of security, where his instincts to serve and protect would be put to use—in ways that no one would have imagined. On July 19, a tornado ripped through Vermeer’s campus, completely destroying one factory and heavily damaging others. It was devastating. I saw it first-hand the next day. Metal was everywhere; cars were piled on top of each other; and brick walls were leveled. Yet there was not a single fatality. Not one. Thanks to Billy’s calm and experienced leadership, the 3,000 employees and visitors attending Vermeer’s customer appreciation day were safe. Even though an “all clear” was issued by a paid weather service, Billy and his team kept everyone sheltered—and in doing so, saved their lives. Billy, please stand so that we can recognize your service, leadership, and bravery. On the same day a tornado struck Vermeer, separate tornadoes ripped through Bondurant and Marshalltown, destroying homes and businesses in their path. In the days and weeks after, hundreds of volunteers showed up to help clear debris and rebuild. Last year, we saw the same thing play out again and again across Iowa. In times of need, Iowans came together. Neighbor-helping-neighbor. And often, stranger helping stranger. Whether it was cleaning up after a flood or a tornado, looking for a missing loved one, or bringing in a harvest after a tragedy, Iowans showed up. It’s who we are, and it’s why I am so proud to be your governor. Join me in recognizing the Iowans who, every day, show acts of kindness, and who truly make this the greatest state in the nation. For those of us who have the honor to represent these Iowans, it’s our job to live up to the example they set. And there’s no better time than the Condition of the State and the days that follow to set aside our differences and forge a common vision. Working across the aisle isn’t an impossible task; we’ve done it. And by continuing to put Iowans first, we honor four public servants, whose belief in diplomacy, principles, and bipartisanship made an incredible difference in millions of lives. In 2018, America lost a great leader with the passing of President George H.W. Bush. A man whose legacy is one of service, statesmanship and values, and whose commemoration served as a reminder to all Americans of the nobility of public service. 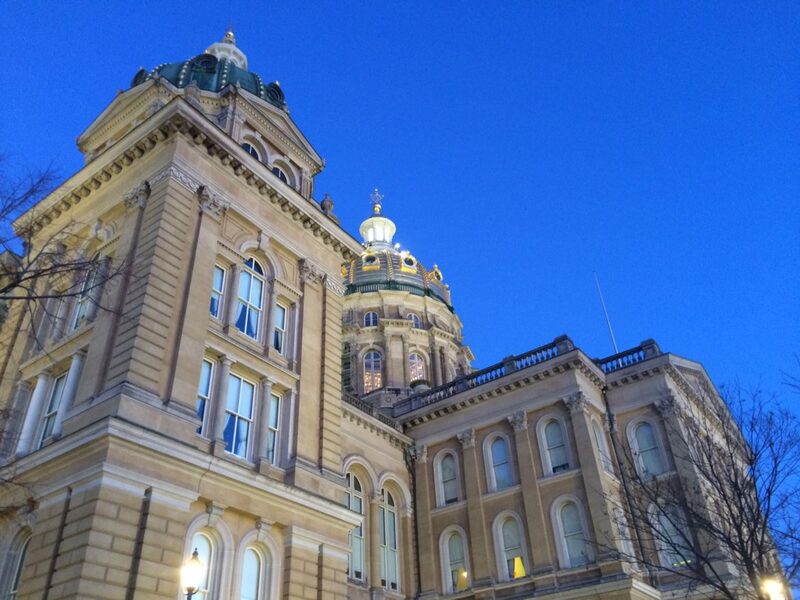 Iowa mourned the passing of Gov. Robert Ray whose civility, courage and common-sense style of governing set the highest standard for those who followed. We grieved the passing of Congressman Leonard Boswell, a proud veteran and public servant who willingly reached across the aisle on many issues to make Iowa a better place. And three weeks ago, we lost legendary Sen. John Culver, whose energy, passion for politics, and timeless wit highlighted the best of Iowa. If we’ve learned anything from the passing of these public servants, it’s this: Working together, with deep resolve, we can achieve more than we ever dreamed possible. Last year was another year of significant accomplishments. Together, we: passed the largest income tax cut ever as part of a groundbreaking tax reform package; continued making education a priority by investing a record amount in K-12 schools and our children’s future; enacted a collaborative water-quality bill, my first as governor; protected the sanctity of life; provided affordable insurance options to thousands of Iowans; and—with unanimous support—enacted comprehensive mental health reform and the Future Ready Iowa Act. Indeed, it was a historic year. As we begin a new general assembly, I’m proud to declare that the condition of the state is strong. Our budget is balanced and our cash reserves are full; wages are going up while unemployment is at an all-time low; and we’ve been recognized as the No. 1 state in the country. Because of our people and the power of their ingenuity, Iowa is soaring. I know, however, that not everyone feels that success. 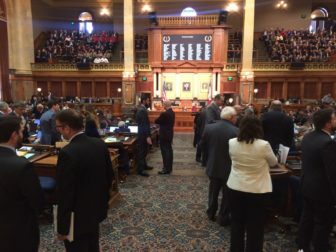 I know that in family rooms, workplaces—and even in this chamber—there are Iowans who are struggling, sometimes in silence. Today, I am asking this Legislature to work with me again to fight for those individuals. To make sure that Iowa’s success is every Iowan’s success. One year ago, I stood at this podium and told you that my vision for the future is an Iowa overflowing with opportunity—opportunity for our working families, young people, and our communities, both rural and urban. A place where it doesn’t matter if you’re rich or poor, young or old, male or female. Where your last name and zip code aren’t nearly as important as your ability to dream and willingness to reach for it. A place where, if life got in the way of those dreams, you can make a new start. And if you’ve made mistakes, you can find a second chance. My vision for the future of Iowa hasn’t changed. But the future I see isn’t around the corner, or after the next election. The future is now. The time is now to deliver on the promises we’ve made to Iowans looking for a way up. It starts by taking the next step to prepare Iowans for dynamic careers and lifelong learning. At its core, Future Ready Iowa recognizes that there is dignity in meaningful work, that Iowans yearn for the opportunity to better themselves, and that those opportunities exist right here in Iowa. It directs resources where we need them most. Identifying high-demand jobs like computer programmers and electricians. Educating Iowans about those great opportunities while providing support for individuals seeking those rewarding careers. We’ve already started putting the policy into action. Last fall, Future Ready Iowa summits were hosted in 18 communities across the state. We brought together employers, educators and local leaders, to discuss how communities could use the Future Ready Iowa Act as a springboard to propel Iowans into new careers. In fact, after one of the summits, the North Scott superintendent decided to launch a Registered Apprenticeship program for advanced manufacturing. Local employers like John Deere and Eagle Engineering already have expressed interest. And students, like Myah Harrington, are eager to sign up. To encourage education and training beyond high school, Fareway has started a program to help employees pay down their student debt. And Ruan Transportation started a technology apprenticeship program that will give young Iowans yet another great career path. We will see this play out again and again over the next few years. Future Ready Iowa is a powerful tool to grow family incomes, meet employer needs and strengthen communities. The time is now to invest in Iowans and their future. Today, I’m calling on the Legislature to take the next step, to appropriate $20 million to fund the plan we put in place last session. This investment will take Iowa to the next level. And more important, it will give more Iowans an opportunity to find a rewarding career. Of course, the road to finding a rewarding career doesn’t start after high school. A strong K-12 education system is the foundation of any state, and Iowa has a solid foundation to build upon. Our schools are filled with innovative teachers, who are making things happen; we have the most extensive teacher leadership and compensation system in the country; a nationally recognized STEM initiative; and we’re getting closer to our goal to have students reading proficiently by the end of third grade. That’s just a sample of the critical work that is underway in our state. But there is always more to do. Kids today are growing up immersed in a world of digital technology. The workforce is continually impacted by innovation and globalization. And we need an education system that adapts to those changes. Because of our investment in STEM, apprenticeships, work-based learning and computer science, it’s happening now across our state. In August we launched a new program called Computer Science is Elementary. Through STEM grants, this public-private partnership will transform six high-poverty elementary schools into models of computer science instruction by weaving computer coding into the class lessons. We’re also seeing other elementary schools expanding or creating computer science programs. Clear Lake is expanding coding and other fundamentals for fourth- and fifth-graders; Kingsley-Pierson is training teachers to teach computer science; and Indianola is teaching coding to kindergarteners, first- and second-graders. Iowa students are getting amazing real-world learning experiences. Like Central Campus in Des Moines, where this week, high-school students will start a semester-long program called NeuroSMART. Through a partnership with Kemin and Des Moines University, and with the support of a STEM Council award, these students will get hands-on experience in the fields of neuroscience and business. In the gallery today, we have first-graders and teachers from Irving Elementary in Indianola and students from Central Campus. Please stand to be recognized. We are excited to see what the future has in store for you. The budget I’m submitting today proposes over $93 million in additional funding for preschool through high school education, which includes a 2.3% increase in per pupil funding. I’m also requesting $11.2 million to help districts with disproportionate transportation costs. And I’m asking for a $1 million increase in STEM funding. In total, that will bring our preK-12 investment to almost $3.4 billion this year. That’s an investment we can be proud of. But Iowans also know that a quality education can’t be reduced to a dollar figure or a percentage increase. It’s about one thing and one thing only: How well we prepare our children to succeed. Over the last eight years, I’ve been fortunate to travel the nation and the world on behalf of Iowa. These trips have provided ideas on what we can do better, but they’ve also given me perspective on what makes Iowa so unique. From river to river and border to border, Iowa is speckled with vibrant communities, each with its own character and story to tell. Every 10, 15 or 20 miles, there’s another town, with another school brimming with pride, and another Main Street filled with excitement and hope. These welcoming and unique communities motivate thousands to ride their bikes from the Missouri to the Mississippi each year. They’re what gives Iowa its character. Unfortunately, in some places, that character is fading. We cannot let that happen. Our communities and Main Streets tell a story to the outside world. My question for each of you is this: How do we want our story to read? That we’ve given up, or that we have hope for the future? That we’re tired, or full of energy? That we’ve lost our vision, or are innovative and creative? That we’re fading or growing? As I travel all 99 counties, I’ve seen the story that many Iowans are writing and the potential to do more. That’s what led me to create the Governor’s Empower Rural Iowa Initiative, a partnership between my office and the Iowa Rural Development Council. Led by Lt. Governor Gregg and Sandy Ehrig, the initiative focused on connecting, investing and growing our rural communities. I want to thank the Lt. Governor and Sandy for their leadership. And I want to thank the members of the Empower Rural Iowa Initiative for their work in providing the initial recommendations. It’s no secret, we need to keep our rural communities connected if we hope to keep our young people or attract others to Iowa. Over a century ago, a town’s proximity to the railroad was key; over the last 100 years, our focus has been on highways and interstates. And, by the way, it’s that focus that finally gave us a completed four-lane Highway 20. Now, though, it’s virtual connectivity that has become essential. Businesses, schools, hospitals, and even our combines, rely on high-speed internet. We have come a long way already. U.S. News & World Report says “the Hawkeye state leads the nation in efforts to bring ultra-fast internet access to every city block and every rural acre.” But there’s still more to do. To ensure that every part of Iowa has the same opportunity, I am requesting $20 million, split over two years, for broadband infrastructure. This funding will accelerate expansion and leverage an additional $120 million in private investment for high-speed internet. Rural communities also can’t thrive without access to housing. Businesses in rural Iowa are growing and hiring, but the employees they need won’t make the move if there’s no place for their family to call home. I am therefore requesting that we double the amount of workforce housing tax credits that are set aside for rural communities, putting the total at $10 million. I’m also asking that these tax credits be competitive, meaning that they will go to those projects that are well planned, not just first in line. When it comes to building strong communities, the talent is there. The drive is there. And often, the programs are there, but the coordination isn’t. That’s why I’m announcing the establishment of a Center for Rural Revitalization within the Iowa Economic Development Authority. This center will focus on making rural Iowa an even greater priority and give our Main Streets a roadmap for success. In places like Jefferson, Iowans are already showing that, with ingenuity and drive, our small towns can be as vibrant as they’ve ever been. Since 2012, over 100 Greene County residents volunteered more than 29,000 hours to raise funds, write grants and work on committees. They’ve transformed downtown Jefferson, attracting 14 businesses and rehabbing dozens of buildings. And recently, voters overwhelmingly approved a bond referendum that will build a new high school that will house a career academy that will feed a new downtown business called the Forge. The Forge, which is owned by Pillar Technologies, will employ 30 technology consultants, many of them just out of high school. Pillar has successfully brought this same concept to Silicon Valley, Columbus, Ohio, Ann Arbor, Michigan, and recently Des Moines. And now it’s coming to downtown Jefferson. Why? Because even people in our nation’s largest cities can see what rural Iowa has to offer. People like Kevin Scott, the chief technology officer of Microsoft and a group of technology investors who paid a visit to Jefferson just last month. Not every Iowa town will be home to a new technology consulting firm. But we should help ignite every community with the passion of the people of Greene County, some of whom are with us here today. Thank you for being that spark. Please stand up and be recognized. Since taking the oath of office, one of my priorities has been to create an integrated and coordinated health care system. We made great strides on that effort last year. We passed legislation that gave Iowans affordable health care options. We worked diligently, and still are, to ensure the that our Medicaid program is sustainable and focused on patient outcomes. And we unanimously passed mental health reform, which built on the changes we began in 2013. And we’re seeing results. In a recent report, Mental Health America declared that Iowa’s overall mental health system is the seventh best in the nation, and third when it comes to the adult system. That’s before the legislation from last year has been fully implemented. This year, the mental health regions will continue developing new services. To help sustain them, I’ve set aside an additional $11 million in my two-year Medicaid budget. And I’m calling on the Legislature to extend the time the regions have to spend down their capital balances and to increase the percentage of their operating budgets that may be carried from one year to the next. Legislators gather for Gov. 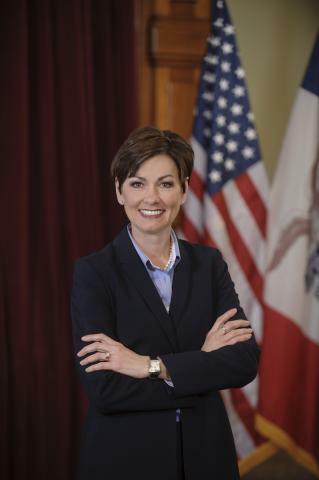 Kim Reynolds’ 2019 Condition of the State address on Jan. 19, 2019. There may still be more to do, so I’m asking everyone in this chamber to work with me to ensure that we have sustainable funding that will keep our mental health system strong. Another essential piece of a strong mental health system is having adequate behavioral healthcare providers. To build on the existing psychiatric residency program, my budget proposes to fund four additional psychiatric residencies at the University of Iowa for doctors who will practice in rural communities. And I’m asking the Legislature to appropriate additional money to train nurse practitioners and physician assistants in mental health. Our efforts aren’t over yet. But by working together, we will have the best adult mental health system in the country. When it comes to our children and their changing mental health needs, we are not as far along. That’s not for a lack of talking about it. We’ve been doing that for more than 20 years. It’s time to move past the talking phase. There is no worse pain than that of a child who is suffering in silence. And there is no greater agony than that of a parent who watches helplessly—not knowing where or to whom they can turn. Diagnosing and healing illness is never guaranteed, but when it comes to physical pain parents know the path to get there. “The doctor will see you now,” is usually just a few minutes or hours away. We must create a children’s mental health system where the path to healing is clearly marked. A system that lets parents know where to begin—and that their child can begin immediately. That’s why, at the end of last session, I signed an executive order creating a children’s mental health board. I asked this group of educators, mental health professionals, parents, legislators and children’s advocates to devise a plan and create a structure for a children’s mental health system. The board has completed its initial task, and based on its recommendation, I will be introducing a bill that finally creates a children’s system that will work in tandem with our adult system. I’m also calling on the Legislature to appropriate additional money for home- and community-based children’s mental health services so that we can eliminate the waiting list that currently exists. And I’m requesting $3 million to train teachers to better recognize early signs of mental illness. Creating a comprehensive children’s mental health system will take time. But we can and must take action. The days of merely talking are over. Three years ago, we began to offer apprenticeship programs in our state prisons. The concept isn’t hard to understand: Most of our inmates aren’t inmates for life. They will reenter society—and when they do, we want them to be successful. Those who can’t get a job often find their way back to crime and then back to prison. So from a public safety perspective, training our inmates is the right thing to do. But there’s more to it than that. As I said earlier, there is dignity in work. There is also beauty in grace. Talk with someone who, by their own actions, hit rock bottom but decided to turn their life around. Watch their face light up when they tell you about the person who offered them a helping hand. A family member, a friend, or maybe a stranger. There are few things as powerful as the joy of someone who got a second chance and found their purpose. If you talk to Michael Willoughby or Steve Shewry, you’ll see it. Both men completed an apprenticeship program in prison: Michael prepared to be a computer operator and Steve prepared for a career in welding. Both men committed serious crimes: Michael was in for armed robbery and Steve was in for willful injury and kidnapping. Both men are now star employees at jobs they landed before leaving prison. They were offered a second chance, they took it, and they succeeded. Frontier Co-Op in Norway and Winger Companies in Ottumwa are the other half of this story. Those are the employers who saw something in Michael and Steve. They looked beyond the rap sheet and found high-quality employees for hard-to-fill jobs. Too often, employers overlook these skilled workers because of the fear of lawsuits. Let’s take that off the table. Our correctional system and parole board are the judge of whether an inmate is ready to be released. Let’s not punish employers for offering an offender a second chance. I am also calling on the Legislature to send me a bill that protects employers like Frontier and Winger who hire Iowans with criminal records. Michael and Steve are with us today. So are Megan Schulte, head of of human resources at Frontier, and Jim Keck, general manager of Winger. Thank you for showing us the value of second chances. Now, more than ever, we need people like Michael and Steve. We have a skilled worker shortage and prisons full of inmates, many of whom will soon re-enter society. Let’s get them the skills they need and place them with the Frontiers and Wingers of this state. To that end, I am announcing today that we are establishing a new home building program at the Newton Correctional Facility. In partnership with the nonprofit Homes for Iowa, this program will provide housing that is needed throughout rural Iowa. And it will provide training for jobs that are in high demand. It’s a win-win. There are other programs across the state that are working to ensure criminal offenders are finding a new purpose. Through a pilot program, the Department of Corrections is currently working with Iowa Central Community College in Fort Dodge to offer Pell Grants to prison inmates. This program is one of the most successful in the country, with more than 420 students participating, earning an average GPA of 3.5. I also recently met with a group of Iowans, led by Tim Krueger, who are working to bring a nonprofit organization called The Other Side Academy to Des Moines. It’s a two-year residential rehabilitation program that is an alternative to prison or jail. And it operates without government funding, sustaining itself through the businesses run by its participants. These are just two examples. Together, I believe there is even more we can do. And we can start with felon voting. Our constitution takes away the voting rights of anyone convicted of a felony. Forever. Only two other state constitutions have a similar provision, and last November, the people of Florida voted to remove their ban. Through the power of clemency, the governor can restore those rights, and I have done that 88 times since taking office. But I don’t believe that voting rights should be forever stripped, and I don’t believe restoration should be in the hands of a single person. After the election, an Iowan stopped me at my grandson’s basketball game in Waukee. I had restored his rights and he wanted to tell me, in person, how much it meant to him. How, when he stepped into the voting booth, he felt a dignity that had been missing, even after leaving prison. I don’t think this man and others like him who have completed their sentences should have to wait for my say or any future governor’s say before they get that dignity back. Our founders gave us a process to amend the constitution, should the passage of time change our view. Let’s begin that process now. I believe Iowans recognize the power of redemption; let’s put this issue in their hands. That’s not the only constitutional amendment we should consider. As it should, our constitution deals extensively with the rights of the accused and convicted. But it never mentions victims. In all of the focus on second chances and forgiveness, we should never forgot about the victims. I know each of you in this room believe that. So let’s show it. This year, let’s start the process of enshrining victim’s rights into the Iowa Constitution. Like 36 other states have done, let’s send victims a loud and clear message: We will protect you. Over the next few months, I look forward to working with all of you to enact these priorities and yours. Whether it’s looking for ways to further reform our tax code, or passing legislation that strengthens our health care system, I am excited for what’s in store. We have laid the foundation for a bright future. Let’s build on it. The time is now to finish what we started. The time is now to cement Iowa’s status as the best state in the nation. The time is now to deliver on the promises we’ve made to Iowans looking for a way up. Thank you, God bless you, and God bless the great state of Iowa.